Beautiful hand crafted sterling silver pin with a LLama of 18K gold. 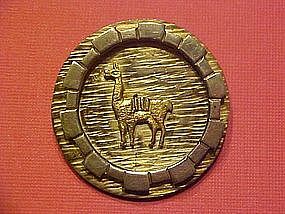 This pin was crafted by Peruvian Indians somewhere between the 1950's to 60's. It measures 1 1/2" in diameter. 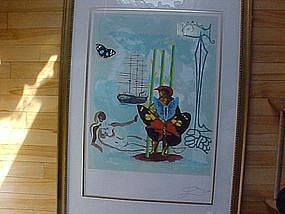 It is signed in the back with makers initials, 925 and a weak strike of 18K. This Beautiful Native Indian pin is a bargain at $65.00. Beautifully crafted hand enameled on sterling silver pansy flower pin with genuine amethyst set in 14K gold prongs from the 1930's. 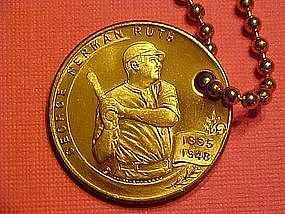 The back is signed, " Sterling/14K." This pin measures 1 3/4" high. In very fine Condition!!! 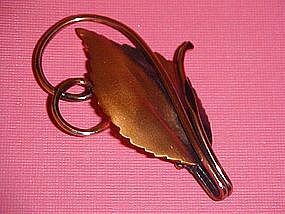 Fine example of Copper crafted jewelry from the Renoir/Matisse workshop of California. Designed by Jerry Fels. Fels combined the qualities of pragmatist, great designer and perfectionist. The Renoir/Matisse line closed in 1964. 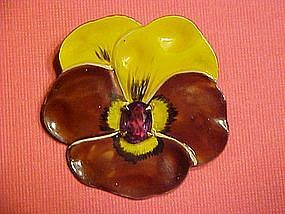 This pin is in Fine Condition and measures 2 1/2" long. 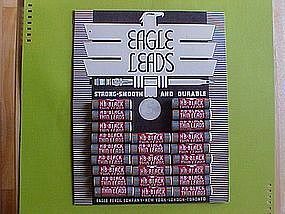 A must have for the 50's enthusiast!!! 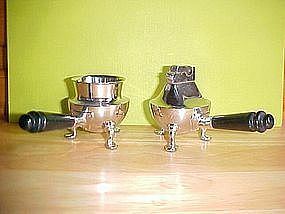 Two piece chromium table lighter set with plastic handles made by A.S.R. circa ealy 1950's. 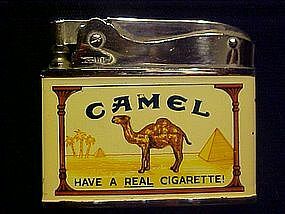 Lighter 3" high and 4 3/4" wide, cigarette holder 2 1/4" high and 4 3/4" wide. In fine condition!! 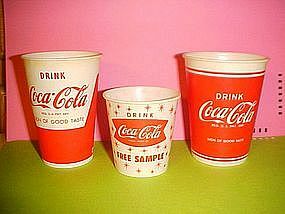 Vintage collection of 3 different types of Coca-Cola wax paper cups. Two are from the 1950's and one is from the early 1960's. They all are in fine unused condition. A fantastic grouping of Coke Collectibles. The two 1950's cups, each stands 3 5/8" tall and the early 1960's " snowflake " free sample cup stands 2 1/2" tall. A unique 3 piece Coke Collection!!! 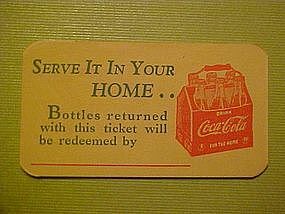 Original cardboard Coca-Cola bottle redemption card issued in the early 1940's. First C of Coca-Cola has trademark within its tail. The front features a 6 pack of Coca-Cola bottles in a brail handled carrier. The back says, " DRINK COCA-COLA IN BOTTLES." This item was never used and is in Mint Condition!!! It measures 2 3/4" long and 1 1/2" wide. 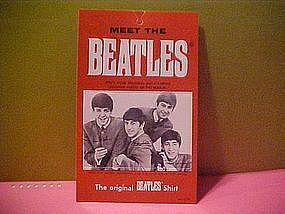 Original Meet the BEATLES cardboard insert that was made to go in the packaging of the original BEATLES Shirt. 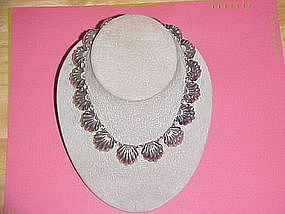 This great Rock & Roll item is from 1964 the time of the original British Invasion!!! It measures 6 1/2" long and 4" wide. It is in Mint Condition and includes a wallet size photo that can be punched out of the perferated area. Again this is an Original BEATLES item!!! 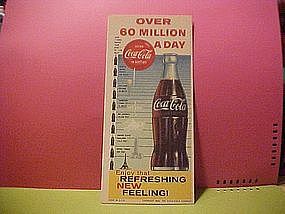 Original Coca-Cola advertising ink blotter from 1960 featuring a giant Coke bottle. It's states, " OVER 60 MILLION A DAY," " Enjoy that REFRESHING NEW FEELING!" The bottom of this blotter reads, " LITHO in U.S.A copyright 1960, The Coca-Cola Company." It measures 7 1/2" long and 3 1/2" wide. This great Coke item is in Mint Condition!!! Original uncut sheet of Bingo Markers given out by Coca-Cola in the 1940's. 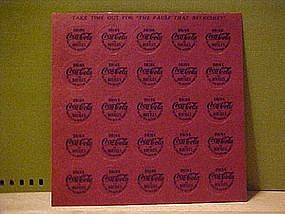 Sheet includes 25 markers, each marker reads, " Drink Coca-Cola in Bottles, The Coca-Cola Bottling Works Co.." The top of the sheet reads, " TAKE TIME OUT FOR "THE PAUSE THAT REFRESHES". This vintage Coke item is in Mint Condition!!! 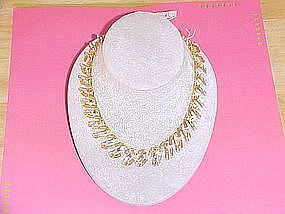 $ 20.00 - SOLD - THANK YOU!! 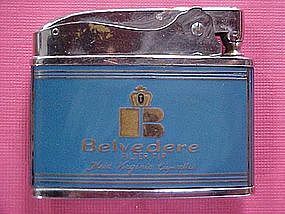 Early 1960's cigarette lighter advertising Belvedere Filter tip cigarettes. Made in Japan by AUER Super quality lighter. In very good condition! 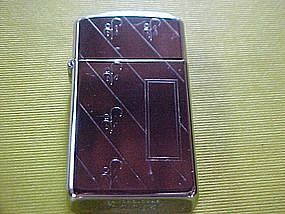 Factory designed engraved Zippo slim cigarette lighter from 1981 in Mint Condition! 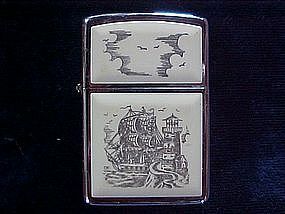 Beautiful Scrimshaw Zippo lighter made in 1984 in Mint Condition!!! This nautical cigarette lighter features a ship and lighthouse with seagulls flying above in the clouds.